I like the idea of having little mementos of our children’s childhoods. They each have a box of things that we can show them when they are older, such as the hospital tags from when they were born, favourite baby toys, newborn clothing, and as they get older, certificates, special drawings and some school things. Having hand and foot prints of our children have been a nice addition to their boxes, as we can look back at how small they were. 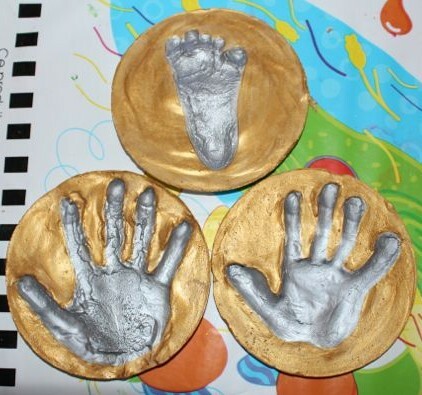 I wanted something that we could display (aside from photographs), and making hand prints in plaster was the perfect solution. I bought a box of plaster-of-paris, and mixed it according to the directions on the pack. 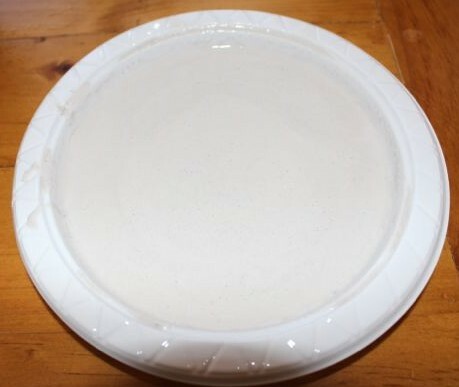 We used some small plastic plates as our moulds, into which I poured the plaster mixture to fill the plate about three-quarters full. 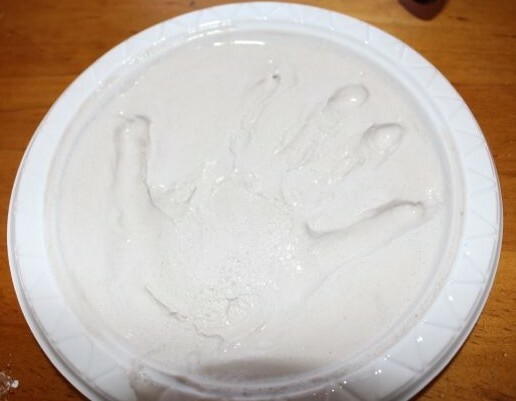 I’d made it a little runnier than necessary, so we waited for it to thicken a little before each of the kids placed their hand, palm down, into one of the plates. 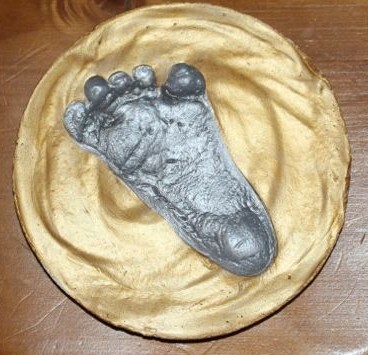 I used Baby T’s foot instead of his hand, as I thought he would probably just scrunch his fingers up in the plaster, and we wouldn’t get much of an impression. L and A held their hands in the plaster for about a minute before carefully lifting them out, leaving behind their hand print. I held Baby T’s foot in the plaster while he sat in the high chair, he was not overly impressed by this. It was very easy to wash the plaster off their skin once the impressions were made. Impression in the wet plaster. We left the plaster to dry for several hours before checking them. They seemed fairly dry, but I left them overnight to dry completely before removing them from the plates. They slipped out of the plates very easily. Impressions in the dried plaster. Once dry, I painted each impression with silver acrylic paint, and then the surrounds with gold acrylic paint. I did a couple of coats to make the metallic colour brighter. I left them to dry overnight, and then I added their name and the date in black acrylic to each one. I’m still deciding whether to add some spray gloss to them. I think it might be a good idea to help protect them, but I have to go and find where the gloss was stashed after our last project to use it.